The Environment Secretary Michael Gove has challenged water companies to increase investment and improve environmental outcomes by 2025. The ambitious measures set out by the Environment Agency in the Water Industry National Environment Programme (WINEP) will see up to £5 billion of investment by water companies in the natural environment through 2020 to 2025. This will help tackle some of the biggest challenges facing the water environment, from the spread of invasive species and low flows to the effects of chemical and nutrient pollution. "I want water companies to invest in the long term future of our environment. It is right that the Environment Agency is challenging water companies to go further. "This significant investment will help tackle some of the biggest challenges facing the natural environment. It will help to improve our waterways, increase biodiversity and combat non-native invasive species. This will support our goal to leave the environment in a better state for future generations." 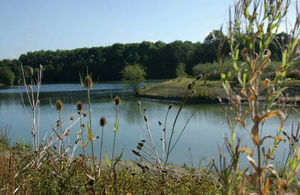 Water companies have a duty to protect and enhance the natural water environment. The government expects water companies to meet the obligations set out in the Environment Programme (WINEP) by 2025. The measures in WINEP represent the basic measures required by water companies to meet their environmental outcomes. However this also presents an opportunity for the industry to develop innovative approaches which will benefit customers, communities, the environment and natural capital. "A clean water environment keeps us healthy, sustains wildlife, and is essential to the success of the economy. Water quality has improved in recent decades but water companies are still responsible for at least one serious pollution incident every week. "We put together a programme of work for water companies over the next five years which will produce significant environmental improvements: protecting and improving over 6,000km of rivers, 24 bathing waters, 10 shellfish waters and 18000 hectares of protected nature conversation sites. "Water companies have until later this year to submit more detailed plans to Ofwat. I’m looking forward to seeing more innovation and less pollution." Certain aspects of the WINEP, on an exceptional basis, will be considered for extension of the 2020-2025 timeframe if they facilitate long term sustainable outcomes and maximise environmental benefits. Water companies have until 30 June to submit their case for extension to the Environment Agency and Ofwat. This ambitious programme marks a real step forward in delivering the environmental outcomes set out in our 25 Year Environment Plan.